Things went really really really well today at my transfer. It all started this morning when I got a phone call this morning from my Re's office. All 12 of our embryos were still thriving and my Dr was considering pushing us back to a 5 day transfer. 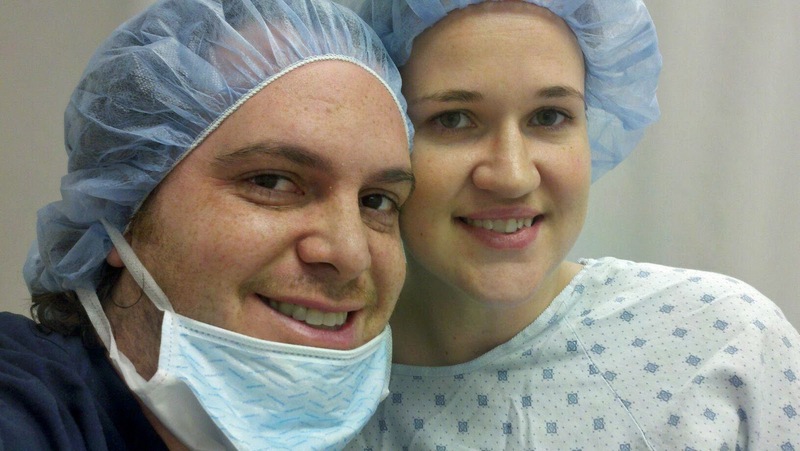 We talked it over and then talked to embryologist who told us it was ultimately our decision. We opted to go ahead with the 3 day transfer. It fit our time line better. This way Mike would be home for the long weekend to take care of London so I can just take it easy and relax for a few extra days. We also already had someone to take care of London, and let me just tell you child care is not exactly the easiest thing to come by with only a few days notice. It was just easier to stick with our original plan. After all London is the product of a 3 day transfer, so it obviously works. :) We will freeze the rest on day 5. 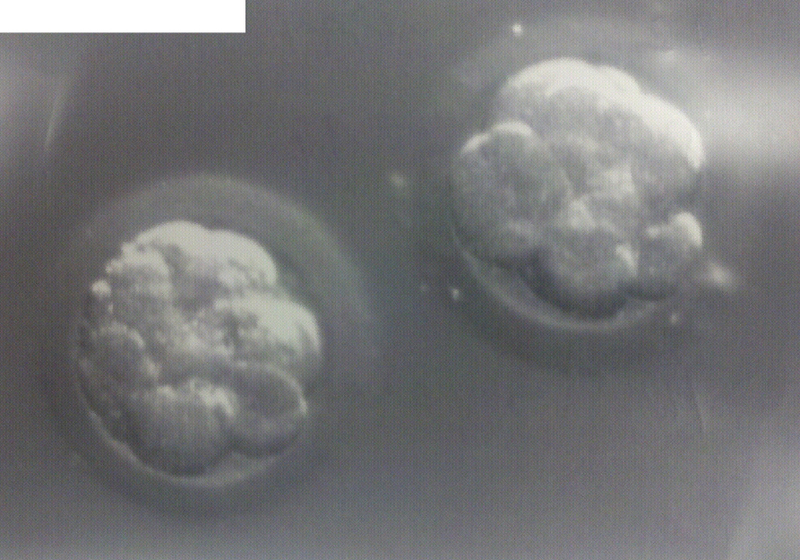 We transferred 2 A+ (highest possible quality) embryos, one 12 cell and one 8 cell. My bladder wasn't full enough so they sent me out of the room TWICE to drink more water. I thought I was going to die. We had tons of time to kill. Thank goodness for smart phones. I was able to beat my husband in a few games of Words with Friends before he got mad and accused me of cheating. HAHAHAHA!! Without further adieu, Meet The Twins! It's so weird to think that those little cell clusters could be living breathing babies in just over 8 months from now. CRAZY!! Official beta is scheduled for 3/3/11, but you better believe that I will be peeing on everything even resembling a pregnancy test starting in about 5 days. My 30th birthday is on Feb 26th which would put me at 7dp3dt and the same cycle day I got my BFP with London. Fingers crossed it happens like that again. I would definitely be willing to accept a positive pregnancy test as my birthday present. I'm headed to bed now. I've had ALOT of cramping since the transfer but laying down flat really seems to help. LET THE 2 WEEK WAIT BEGIN!!!! WOW! Ok I LOVE that you have embryo pictures that is so amazing! What a cool thing for a baby book. Lots of thoughts and prayers coming your way!!! What a great looking pair of embryos! Hope your 2ww goes by quickly. That's fantastic news! Good luck during your TWW and I pray that they are sticky little beans. It would be an awesome present on your birthday to get a BFP. Yea for such positive thoughts and beautiful embryos! That picture is awesome :) I've got everything crossed for that perfect birthday present! So glad everything went well! Hope this 2WW goes by fast and ends with a BFP! Oh Aly, I am so excited for you guys!!!! Good luck on your 2ww! Aly, I am so excited for you. My fingers are crossed and I am sending sticky thoughts your way. That sounds so great!!! Sending sticky vibes your way and hope the 2WW can fly by! Sooo happy everything is working so well for you:) GL in the 2ww!! Oh, I am so excited for you! It sounds like things are looking really good! Keep your feet up and let those embies do their thing! congrats! hope the 2ww doesn't torture you too badly. what an awesome bday present a BFP would be! good luck! Lookin' good. Best of luck! Hope its a quick 2WW! Sending positive thoughts your way!! Cutest twins I've ever seen! Thinking of you guys! YES YES YES! I am so excited for you!!!!!! Beautiful picture of the twins! Fingers crossed for you!